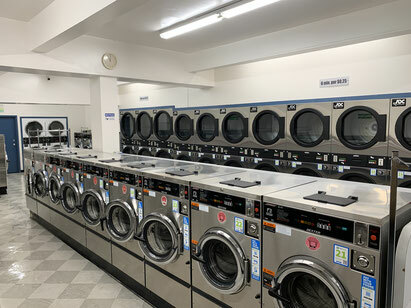 Welcome to Sunset Blues Laundry!! Sunset Blues Laundry offers two neighborhood laundromats serving the Sunset District of San Francisco. We understand that for most of us, doing laundry is not voluntary, but necessary. Thus, we try our very best to make your visit to our stores as efficient and as pleasant as possible. Since 2013, we have upgraded >85% of our washers and dryers at our Judah location and all washers at our Irving location to help our customers save time and money. A lot of research was conducted before selecting our state of the art machines! They are all made here in the USA with the latest technology and are energy and water efficient. It is our mission to keep all machines in working order, maintain a well lit, clean and safe space for your visits. Thank you for choosing Sunset Blues! EXPRESS WASHING MACHINES: We offer high express washers in 4 different sizes: 20lb, 30lb, 40lb and 60lb. All express washers feature high 200 G-Force extract speed, that's double the speed of non-EXPRESS washers so clothes come out drier, thereby save you dry time and money! 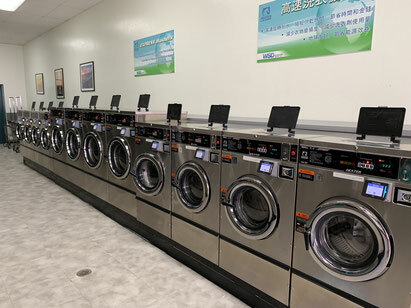 Sunset Blues is one of the few laundromats in the Sunset District offering Express washing machines. Just how much faster do these Express washers spin? Check out the table to the right! 20lb: If you like to do your laundry more frequently or have smaller loads, the 20lb washers are your friend. 30lb & 40lb: The 30lb and 40lb washers are great for families with multiple loads or greater volume of laundry. 60lb: The monster 60lb washer is ideal for king size comforters, quilts, curtains, and rugs. It is also the ultimate solution to those who prefer to wait until their very last pair of clean underwear before visiting Sunset Blues to wash their entire wardrobe all at once! Place Tide pods and liquid laundry pods with your clothes directly in the washer rather than the “detergent” compartment of the automatic dispenser on the top of the washer. Cold Water: Best for dark colors, bright colors that bleed, delicate fabrics and any lightly soiled clothes, such as office wear. Cold water is a good choice for permanent press and delicates. Cold water will not harm any washable fabric. If you choose cold water, you may need to pre-treat or pre-soak your clothes if your laundry items are heavily soiled. Warm Water: Best for durable colors, man-made fibers, knits, jeans, and other synthetic, permanent press fabrics. Warm water should be chosen for any colored garments that are heavily soiled with oil or stains. Our Dexter Express front load washers default to warm water as most clothes can be washed in warm water. It offers good cleaning without significant fading or shrinking. Hot Water: Best for white cotton fabrics such as underwear, socks and bed sheets, typical dirty clothes and diapers. Use hot water to remove germs and heavy soil from work jeans, mechanics' overalls, kids' play clothes. Hot water may be needed to remove stains, but can shrink, fade and damage some fabrics, so be sure to read your clothing labels before selecting the hot option. In general, the lower the temperature of the water, the more detergent you need. Washing heavily soiled articles with hot water can set stains. For heavily soiled clothes, pre-wash them in cool water, then wash them again in hot water. All wash cycles rinse in cold water as it reduces wrinkling and will not set stains. EMERGENCY STOP FEATURE: All Dexter washers feature an easy-to use emergency stop button for peace of mind. The simple 3-2-1 countdown and audible signal allows the cycle to be stopped quickly in the event of an emergency. The emergency stop button stops the cycle, drains any water and then unlocks the door. The washer can then be re-start at the same spot in the wash cycle. If the emergency stop button is engaged a second time during the wash cycle the machine terminates the wash cycle. A new cycle starts through the normal process.